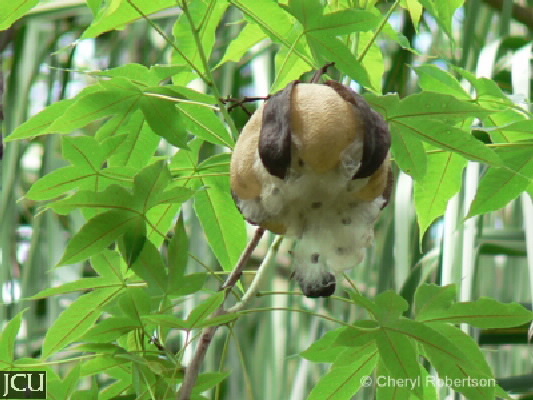 This native tree is deciduous when flowering. 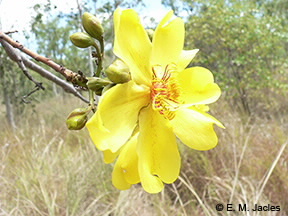 The large yellow flowers, with 5 petals to 4 cm long, and numerous stamens, are followed by large brown capsules (6-9.5 cm long), which split open to reveal 2 contrasting layers and numerous seeds covered by long hairs. The leaves are palmately or deeply lobed. Commonly found growing on dry rocky hill slopes as on Magnetic island and around Bowen, there are a number of trees on campus particularly in the median strip of the eastern ring road and in the neighbouring bush. 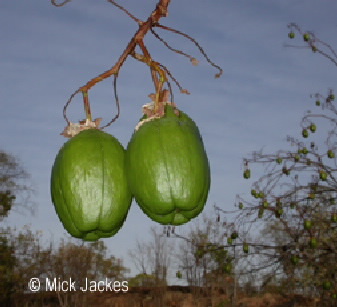 This genus is sometimes placed in the family Bixaceae.